iTrack Solo provides the best solution for recording your instruments and vocals using an iPad. Featuring a Focusrite microphone pre-amplifier and an input to record directly from electric and bass guitars, iTrack Solo is the perfect way to expand the audio capabilities of your iPad using Garageband or any other music-making app. Although it is an Apple certified “Made for iPad” device, iTrack Solo is also fully compatible with your PC or Mac computer and comes with a host of free music making software including Ableton Live Lite and the Focusrite Scarlett Plug-in Suite. Just connect your iTrack Solo to a power supply and an iPad and you’re ready to go! With the very best in digital audio technology encased by a rugged aluminium unibody chassis, iTrack Solo will capture and playback your sound with pristine quality. 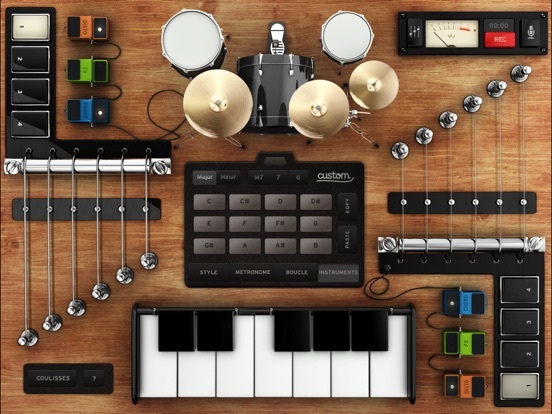 The front panel has an input for a microphone and an input for an instrument (such as an electric guitar, bass guitar or the output of an electro-acoustic guitar). This makes the iTrack Solo perfect for capturing the output of a microphone, or using an electric guitar with one of the many guitar amp applications on iPad. Unique signal halos let you know that you’ve got a good audio level for recording. Green is good and red means that your audio is too loud, and that your should turn down the level control. Use the iTrack Solo’s premium quality audio outputs to take your sound to Hi-Fi, speaker systems or headphones to hear the difference Focusrite can make. At Focusrite, that’s all that matters – Sound is Everything. A supplied cable connects iTrack Solo to the iPad, and it is powered by the included USB cable that delivers the power necessary to run the iTrack’s high-specification components. IK Multimedia continues to introduce both useful and innovative products aimed at iOS music makers and music lovers, with the recent release of a quality built portable microphone, called the iRig MIC Cast. While the packaging suggests that the iRig MIC Cast is ideally suited to voice recordings, such as podcasts, lectures, and interviews, it is equally suited to field recording of sound effects, and also for simple musical recordings. Also included with the iRig MIC Cast is an adjustable stand, designed to accommodate an iPhone or iPod Touch. It’s a great addition, as it keeps your device in a secure position while recording, so it won’t pick up any unwanted sound from holding it in your hand. The stand actually comes in handy as somewhere to place your device in general everyday use. The microphone itself is simple in design, featuring a chrome and black two tone look, which gives is a slightly classic high end microphone feel. There is a handy gain switch on the front side that gives you the option of LO and HI, with LO being suited to normal close range audio signals, and HI which boosts the input signal for low level sound sources. The polar pattern of the microphone is unidirectional/cardioid, which means you get a pretty clean signal from directly in front, and much of the background noise is ignored. When compared to the built in microphone on the iPhone, there is notably more background noise on recordings than with the iRig MIC Cast. The fact you can swivel the microphone around 360 degrees means you can hone in on exactly what you want to record. The frequency response is between 100Hz and 15kHz, which is more than enough for general purpose use, and even covers most musical instruments, except perhaps those that produce a very low frequency. The other significant feature of the iRig MIC Cast is that it offers a stereo headphone output on the side of the microphone. Since it needs to be plugged into the iPhone’s headphone port to operate, this means you still have access to the audio output, which in some scenarios, such as multitrack recording, you’ll want to be able to hear the playback of other tracks as you record fresh ones. IK Multimedia promotes two of its own apps as supported by the microphone, including iRig Recorder and VocaLive, which are available in free lite versions and fully featured paid versions, though you can expect the microphone to work with just about any audio recording app that accepts a mic as an input source. I’ve been testing the microphone out for a few weeks now, across a variety of scenarios and it definite improvement over the built-in mic on my iPhone, and the cheap detachable microphone I bought off eBay awhile back for recording interviews. If there was just one feature I’d like to see added in any updates to the iRig MIC Cast, that is the ability to do stereo recordings, which would just make it all that more useful, especially for music recordings. Loopr is a pro oriented multi-track audio looper. Loopr offers you a very low latency mean to record and play loops. You can create, practice, jam along, or sample audio soudscapes easily with this simple to use app. Developed by long-time expert loopers, it is focused on ergonomy and simplicity through one finger controls but also via hands-free MIDI pedalboard compatibility. It enables synchronization with drum machines and sequencers via its precise MIDI out sync feature, but also fast multi-layer recording via its ‘fast recording mode’. Loops can be sent as independent files (including tempo and time signature information), which lets you share the groove with most desktop audio production apps (e.g. Logic Studio, Garage Band, …). CoreMIDI and CoreAudio compatible to use with the most popular iOS compatible interfaces. Chicago based, WaveMachine Labs, has finally taken the wraps off its much anticipated Digital Audio Workstation, which has been built from the ground up for the iPad, and it’s called Auria. This is not only new turf for this software developer, who is well known for its Drumagog drum replacement plug-in, but the Auria app sets a new benchmark as far serious audio recording capabilities on an iPad. I’ve had a chance to play with Auria for a few weeks now, and wanted to give some quick thoughts on my experiences with it. Anyone who has been following the development of Auria since it was first unveiled at NAMM will know, one of the big drawcards is the app’s familiar looking, professional interface, especially for those that are accustomed to working with multitrack DAW software, plus the impressive VST effects plug-in support, and playback of up to 48 mono/stereo tracks, of which 24 can be recorded simultaneously provided you have an interface that offers this. These sorts of features have simply not been thought possible on an iPad, up until now. I don’t’ actually own a USB audio interface that offers a couple of dozen Ins and Outs unfortunately, so I’ve been testing Auria out with my trusty PreSonus AudioBox 2/2, however the app works perfectly on this audio interface. WaveMachine Labs has a growing list of supported interfaces that have been tried and tested, so it’s worth checking the support area of their site to see if your hardware has been tested already. It’s worth noting that most USB interfaces will required a powered USB hub, as the iPad simply doesn’t have enough juice to feed most audio interfaces. Rather than in an in-depth review, what follows is my hands on experience with the sample recordings I’ve done to date, as well as playing around with the demo multitrack recording that WaveMachine Labs made available for beta testers in the weeks lead up the launch. I’ve had a couple of decades of experience in the broadcasting and music industry, working daily with various analogue/digital mixing boards, racks of outboard effects, and most of software DAWs on the market, dating back to the pioneering days of Pro Tools, when it was referred to as Sound Designer! While several multitrack apps have already been released for the iPad, one of the most exciting things I recall when I first saw screenshots of Auria, was the familiar looking interface, together with a feature set that matched, and in some cases, exceeded the capabilities of some computer based audio recording and mixing software. Before even laying so much as a finger on the app, I felt like I wouldn’t be faced with the usual week or two of having to learn a completely new interface from scratch. And I was right. Upon loading up Auria for the first time, the default screen is a familiar looking analogue in-line mixing board, featuring volume faders with VU metering, pan controls, aux sends, solo and mute buttons, plus a handful of other software buttons and the typical group transport controls found on most other DAWs. The other main view in Auria, like in other DAWs, is the editing view which is where the individual tracks of recorded audio appear as visual waveforms, which can be manipulated in a variety of familiar ways. As mentioned, Auria supports playback of up to 48 tracks of stereo audio at any one time, however this track count is halved if you using the iPad 1. I’ve only tried out files with up to 20 tracks so far, and have had no issues at all. As well as firing up a few of the sample songs, I’ve also tested out importing some existing multitrack sessions I’ve recorded previously in Pro Tools, and this process works flawlessly. In fact, it’s simply a case of saving the session in AAF format, zipping it into one file, and pulling it into Auria through iTunes. With a selected multitrack session loaded up, in the edit window, pinching and zooming with two fingers anywhere on the screen allows you to quickly go from a full view of the entire session, right down into a close up view of a single tracks of audio. It’s highly intuitive to use, and while there is a touch of lag with some of the busier sessions, it doesn’t affect the over operation. The editing process will also feel familiar to anyone that has done any non-linear editing with software. You simply double tap on a piece audio to mark it, then proceed to drag over an area to highlight it. From there, the usual cut, copy, split, move, separate and lock regions can be selected from the edit dropdown menu. The beginning and end of audio regions can also have a ‘fade time’ easily created by dragging out the amount of face time required. Different fade types can also be selected. With an area of audio selected, it’s also possible to apply some processing, such as gain, normalising, and even reverse. While this will feel very familiar to anyone used to DAW software, I also had someone who isn’t experienced try out the interface and they found it easy to come to terms with. Another area I quickly wanted to touch on in this quick look, is possibly one of Auria’s strongest points, and that is the VST plugin support, which is a first for any audio/music app on iOS. WaveMachine Labs has been working with developers such as PSPaudioware, Fabfilter, Overloud, and others to produce versions of their plugins that will work within Auria. The app ships with a vintage-inspired channel strip created by PSPaudioware, which is features an Expander, Equalizer, and Compressor on every single channel of audio, plus there is a mastering processing available for subgroups and main stereo output. It also includes a convolution reverb, stereo chorus and delay, classicVerb and a pitch processor. From within the app, however, you also can head to the online Auria Store, where a growing number of 3rd party plugins can be purchased and downloaded directly into the app. WaveMachine Labs has already launched an Auria friendly version of Drumagog 5, and Overloud has the virtual guitar amp THM available, plus there are several plugins from PSP Audioware and FabFilter. I haven’t had the chance to explore all of these in great detail, but I hope to report on this in a more detailed review in the future. So this write up is really only intended to cover the key essential features of Auria, and it’s the finer details, open ended support, and professional touches that really make this unique app the complete package that it is. If you’ve been using Auria already please share your thoughts below. Ok, so this one isn’t designed for ‘creating’ music, but if you spend any amount of time with mics in a studio or on stage, this could be a handy free app to have on hand. Did you ever wish you could carry one of the world’s greatest live sound engineers in your pocket or backpack? While MicVault Live doesn’t make that possible, it comes pretty close. Whether you are a seasoned pro or a hobbyist, every audio engineer and musician find themselves needing advice on deciding what microphone to use on a particular sound source from time to time. If you do not have the phone numbers of the world’s top engineers on speed dial, MicVault Live will instantly save your day by offering advice from three seasoned pros, Jason Spence, Chris “Sully” Sullivan & Chris Taylor. MicVault Live includes microphone recommendations for everything from drums and percussion, to strings, guitars and vocals. And, if the recommended mic is beyond your price range, the engineers offer a low-budget alternative (if they feel there is one). These three engineer’s credits run the gamut of commercial music and include artist’s such as Lynyrd Skynyrd, Janet Jackson, Keith Urban, Barbara Streisand, Joe Cocker, Steven Curtis Chapman, Megadeth, Jewel, Conway Twitty, and Amy Grant. Their TV mix credits include Grammy Awards, Super Bowl, CMA Awards, CMT Awards, MTV Awards Europe, and the Garth Brooks Central Park concert. MicVault Live makes the experience these engineers gained while working with these artists and events available to you in a simple, quick and easy-to-use interface. The easy-to-use app includes photos of all of the recommended microphones, as well as links to the microphone manufacturer’s websites. 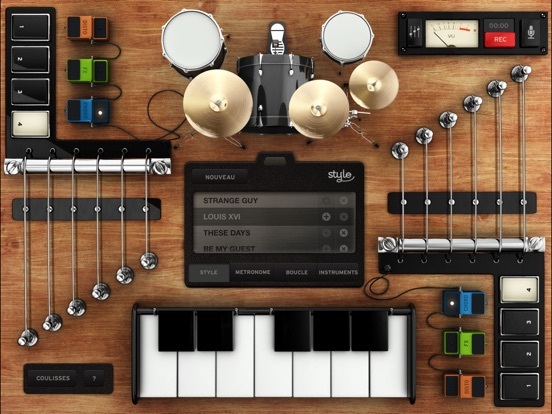 Roland continues to release free apps, designed to work with their range of music gear. This is one of the few that might be useful even if you dont own their gear. Air Recorder is an app that lets you enjoy high-quality recording with easy operation. You can record sound through the internal mic of your iPhone/iPod touch, or wirelessly make digital recordings of the sound from your Roland electronic musical instrument. You can also load songs from the music library of your iPhone and play them back while recording your instrument as you play along. ● You can use the internal mic of your iPhone/iPod touch to record your instrumental performance or your band. You can also load and play back songs from the music library of the iPhone. During song playback, you can use convenient practicing functions such as speed/key adjustments and AB repeat. ● You can use Air Recorder with a Roland electronic musical instrument that has wireless LAN functionality, and digitally record the sound of your instrument wirelessly. Songs loaded from the music library of your iPhone can also be sent wirelessly and digitally to your instrument; you can then play along with the song on your instrument, and record the mix on your iPhone/iPod touch. ● The recorded audio can be used via AudioCopy with any app that supports AudioPaste (e.g., GarageBand). You can also use Open in… to export the audio to another app that supports WAV or AAC file formats. * If you’re unable to connect to the wireless LAN access point, try connecting using Ad-Hoc mode. * Songs with DRM (Digital Rights Management) cannot be loaded. Songs upgraded to iTunes Plus can be loaded. * If a song is played back while you’re recording from the internal mic, the iPhone is designed to play back through the ear speaker rather than the internal speaker. If you connect an audio device to the headphone jack, the song will play back from the connected audio device. * If you’re using an iPad2, please specify WAV as the recording format. Recording operations will be less responsive if you choose AAC. Having already released a collection of patches and presets for NLogSynth PRO and NLogPoly Synth, and more recently for NanoStudio as well, Matthias at App Sounds has just released another new product called GB Inspirator, which is essentially 30 short patterns of fully arranged music in a handful of different styles, that are designed to be loaded into GarageBand for iOS, and used as ‘inspiration’ for your own original music. GB INSPIRATOR is like a journey between popular music styles in past and present times. You will be impressed by funky drumgrooves, house patterns, chill out motions, rock and jazz tunes or rnb and hiphop elements. Some of the designed layouts are really unique. You will see how much fun it is to start with GB for iPad for composing new tracks. 30 songs for Apple GarageBand iOS, each song contains a basic arrangement of mostly four tracks (drums, bass, keyboards, synths or guitar) with the length of 8 bars. You don’t find any audio track. All drum grooves, riffs and phrases are midi sequences for a high flexibility. The entire collection will only set you back a few dollars/pounds/euros. 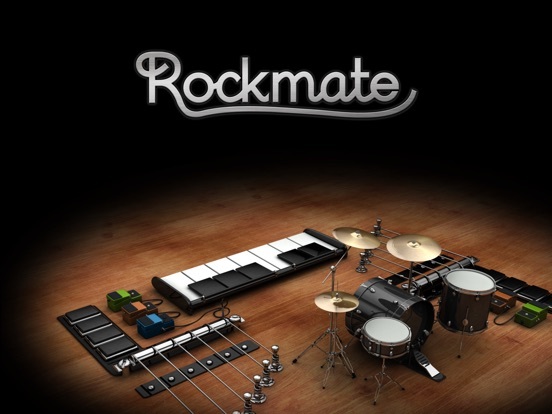 Still one of my fav music apps on iPad, Rockmate is so refreshing and fun to play, especially with a bunch of….mates! Apart from an expected Retina visual update, there’s some new sounds, plus singers can now join the jam! Fingerlab is very proud to announce the new version of Rockmate V1.1 with the addition of new super cool features: microphone, Retina graphics, new sharing options, new drum kits and new keyboard kits, for an even better music experience with your iPad. *Jam Session and iCloud are available on iPhone 4 or later, 4th generation iPod touch, and all iPad models.